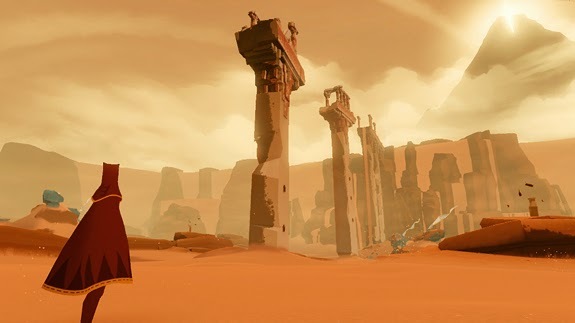 Only two years since release, and I'm already playing Journey as Ritual. This week's PopMatters article is about my personal experience and introspection, but if you are interested to read more about rituals as they relate to games, there is plenty of more insightful pieces than my own. I quote Janet Murray in my article of course, who's Hamlet on the Holodeck touches briefly on the process of entering into the game world. Arnold van Gennep's discussion of preliminal, liminal, and postliminal states in The Rites of Passages is also significant, which Devin Proctor discusses in relation to games right here. The anthropology of games is a rich field for those interested. For many, any time a player enters a game, leaving their self-behind and taking on a new role, they partake in a ritual. In this piece at least though, I wanted to differentiate the traditional process of play from one in which you explicitly play a game as a ritual. I entered Journey open to a particular experience, primed for it. Going it mostly alone though changed the experience for me into one of self-reflection. I explore this self-reflection through faith and religion because it provides a familiar language for me to express those ideas. After rereading the article, I realize it sounds like I'm finding my faith again, which is certainly not the case. Rather, I am finding a connection between the safe introspection through play as ritual and the safe introspection one can experience through religious ritual. I would be remiss here if I didn't mention the fantastic work of the folks over at Christ and Pop Culture. They consistently delve into personal issues of faith as it relates to games and entertainment and I respect them immensely for their passion and sincerity. I would be honored to reflect their artful candor in my own work even a little.